The Western Washington DX Club, one of the largest and most active amateur radio clubs on the west coast congratulates Barbara J. Tower, K7GRL, of Coos Bay, OR on her selection as recipient of the W7PHO Memorial Scholarship. 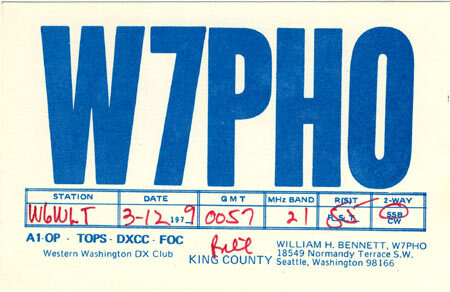 The William Bennett, W7PHO, Memorial Scholarship was established after the death of WWDXC founder and larger than life DXer Bill Bennett back in 1989. Initial scholarship funds we provided by Bill’s friends up and down the West coast and world-wide. The endowment is maintained by the ARRL Foundation. High school seniors located in the ARRL Northwest, Pacific, or Southwest division who are interested in the W7PHO scholarship program can apply between October 1st and January 31st directly to the ARRL Foundation’s Scholarship Program. More than 80 scholarships ranging from $500 to $5,000 are awarded through the ARRL Foundation scholarship program.